Pity poor Dr. Dann, recruited by Dr. Noah Catledge to serve as a physician for Project Polymer, the Department of Defense’s parapsychology research program. Dann didn’t join the program expecting something as fruitful as Heinlein’s “Project Nightmare,” but he couldn’t not have expected the collection of probable frauds and self-deluded eccentrics to whom he found himself ministering. Catledge dreams of the day when humanity finally makes contact with aliens. He would be pleased to know that in a stellar system not so far from the Solar System is the planet Tyree, a world that is home to strange flying beings quite unlike humans but every bit as intelligent than humans (or perhaps even more so). For its intelligent inhabitants, Tyree is a world of winds; the solid surfaces underneath are unknown territory. Thanks to rare stable weather formations like the Deep, a few of the flyers have been able to create a highly advanced culture, albeit one denied the rich assortment of physical tools available to humans. Intelligence can take even stranger forms than it does on Tyree or Earth. One of the odder instances, a vast, cold, diffuse structure of unimaginable power, profound ignorance, and haunting guilt, is bearing down on Tyree’s system. It would be of little comfort to the inhabitants of Tyree if they knew that the vast entity understands too little about the universe around it to grasp the effects of its actions. The entity has grown curious about systems like Tyree, but its explorations invariably leave the subject of its research dead and lifeless. Happily for the flyers, there’s a way out; the very psychic powers humans struggle to prove even exist are commonplace abilities for the flyers. Those powers would allow the flyers to transport their consciousnesses to the bodies of beings on a world safe from the entity’s world-murdering curiosity, a world known as Earth. A better term than transport would be exchange; the flyers would commandeer the human bodies, while exiling the human minds to the flyer bodies—bodies trapped on a world doomed by slow irradiation from a chance-born, fallible deity. And of all the humans on Earth, the ones most vulnerable to the flyers’ far-reaching body-swapping powers are the assembled psychics of Project Polymer, including, much to his surprise, Dr. Dann…. This was a very odd Tiptree—actually a more apt term would be “atypical.” It was not what I remembered. I wonder if I actually read the whole thing in the 1970s and forgot the entire final third or if I set it down intending to get back to it and never did. The first two-thirds do, after all, fit my expectations of a proper Tiptree story: it should end in tears. Whenever I find Peter Watts too upbeat, I turn to James Tiptree, Jr. This book certainly features people doing terrible things for what seem to them sufficient reasons. Tiptree establishes early on (in a scene uncomfortably reminiscent of the official justifications for Canada’s now-discredited residential school system for First Nations children) that the flyers are very protective of flyer children. Any crisis that threatens the children will no doubt be seen by at least some of the flyers as sufficient justification for acts that would otherwise be considered abominations. The humans on Earth are themselves the sort of characters one would expect in a Tiptree work: an ethically compromised doctor working in a program he suspects is futile and a collection of damaged people serving as research subjects for a fellow far more optimistic than sensible, in the service of a military-industrial system that would see better results from the money spent on this ill-conceived project if the money were just piled up and burned. The taxpayers could toast marshmallows and s’mores. There’s also the thing between the stars, an entity that fled its duty and whose view of itself is summed up by the name it has adopted: THE EVIL ONE. Imagine my surprise when the unintentionally genocidal godling, the desperate aliens, and their human victims manage to fumble towards what to my increasing amazement could only be described as a “happy ending.” Perhaps that’s the mark of a talented author: ability to surprise the reader, even a reader who thought he was sufficiently familiar with the author’s work. 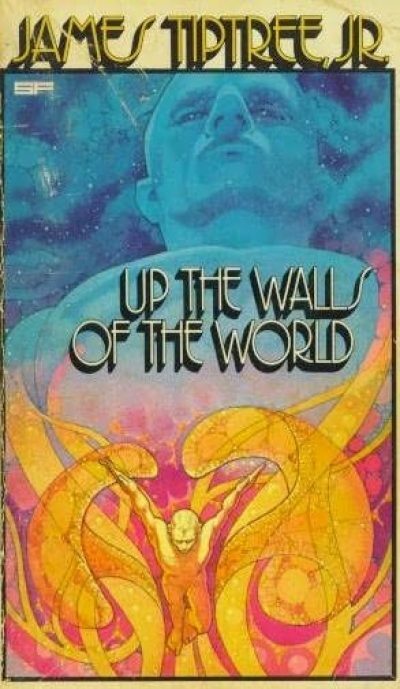 Up The Walls of the World suffers in comparison to Tiptree’s short works, but it would have to be stellar not to suffer comparison to her very fine short works . This is a competent novel and if it’s not on a par with “Houston, Houston Do You Read,” “The Screwfly Solution,” or a “Love is the Plan the Plan is Death,” I still don’t regret or resent the time I spent reading it. But I did find myself thinking that I would like to find time to re-read one of her collections, preferably Warm Worlds and Otherwise (if only for the ineluctably smirk-provoking Silverberg introduction). 1: I was wondering if I would get through this without at least one footnote. Nope! Even twelve years after the publication of Up the Walls of the World, Dorothy Heydt’s The Interior Life demanded more in the way of font variation than its publisher was able to deliver. Sections that needed to be visually distinctive from each other were not, to the detriment of an otherwise noteworthy novel. 2: One of the many fine qualities for which I value them is the little thrill at the end, when I realize that I have managed to emerge from a Tiptree story without being inextricably shrouded in profound, endless depression.